This was to be the last leg of our adventure around the Middle East. Having done this road only a week before, and being well aware that there’s a serious lack of petrol stations, we embarked on the last 600 km part of our drive with a very full tank and of course plenty of provisions. I was tired from the lack of sleep the night before but eager to tackle the final part of our trip. We headed out of Abu Dhabi and into the desert, a few road changes here and there but nothing too alarming, we managed OK between some common sense and GPS. 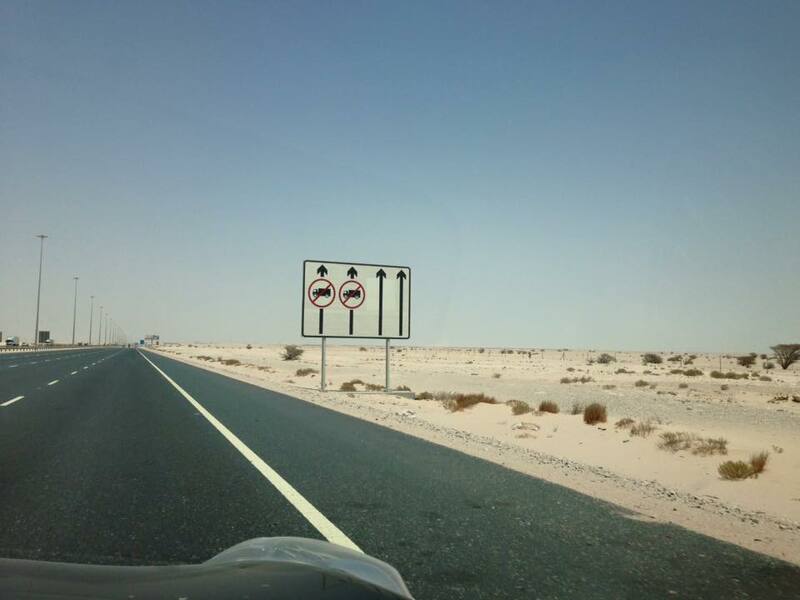 We arrived at the border between the Arab Emirates and Saudi, I got out of the car to do the paperwork. Just like on the way in, this was a lovely building with not many people, lots of counter space but only one person working. I attempted to make some small talk but this sort of fell on deaf ears. After checking my paperwork pretty thoroughly and asking all the places we had been she asked for my credit card to pay the departure fee! Anyone reading this planning this trip, the departure fee was 97 UAE Dirham for the 3 of us. Not entirely sure why we had to pay to leave UAE to enter Saudi but not when leaving UAE and entering Oman is a mystery. However, I wasn’t going to start asking! All was going well until I was given Cathy’s passport and mine back but they held onto Katja’s passport, I was told to sit down and wait. The lady behind the counter left her chair and went to a different office to check something with her boss. She then returned to he seat and carried on serving other people.I’m not sure how long I waited, but it sure as hell felt like a very long time. Eventually, someone came out with Katja’s passport. The lady behind the desk called me up, gave me Katja’s passport and we were free to go. I have no idea what all that was about! Cathy had her abaya and head scarf back on ready to tackle the Saudi Arabian part of the trip. 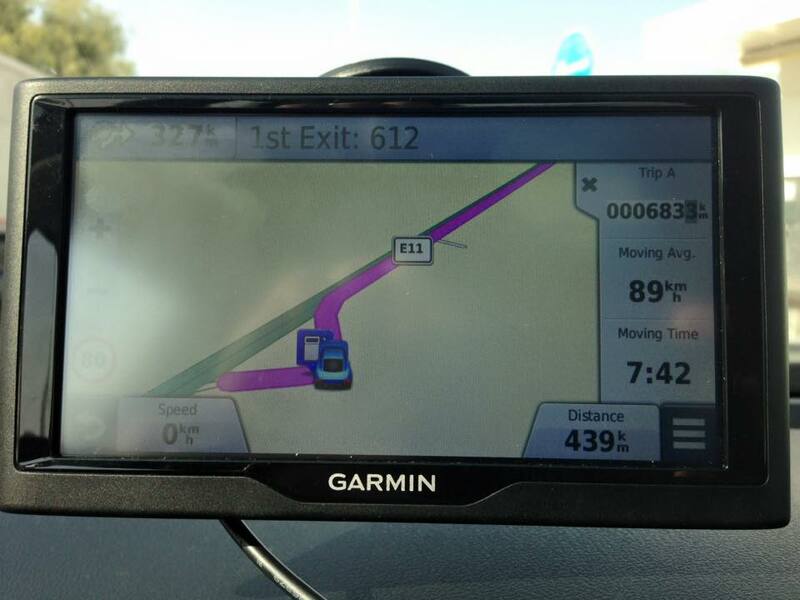 We crossed the border without too many issues and we were once again driving on Saudi territory. We reached the Saudi/ Qatar border after driving past a caravan of trucks which went on mile after mile. They were all queuing to go through customs and into Qatar I guess. The only green light led us to a bunch of spikes on the road and nobody to be seen. We waited several seconds before deciding to reverse and go through a different entrance (big mistake, don’t do this!). As soon as I had done this I upset an officer at the border. He followed me up to the next booth, got out of his car and quite sternly asked my why didn’t I stop! Feeling quite foolish at my mistake, rather than making excuses I apologised profusely for my minor indiscretion. I think I looked so pathetic he felt sorry for me. Crossing back into Qatar was straight forward and we were back home by lunchtime! It has been a brilliant adventure, one not many people will ever have the chance to do. When you go on a road trip you see and experience so much more, I appreciate flying is the most sensible and convenient way of traveling, but we miss out so much. Doing these sort of distances in a car with a 5 year old can be daunting, Katja was so well behaved, I wouldn’t hesitate to do something like this all over again at the drop of a hat. The secret was to keep her entertained using a mixture of her iPad to watch TV, a few toys and snacks on demand, She only mentioned once, maybe twice if it was much longer, and that was at the Saudi/ Qatari border on the way back! We covered a tad under 1,500 km in total, this included getting lost and detours plus wandering around! This entry was posted in Foreign Travels, Life in the Middle East. Bookmark the permalink.